“Like a Hurricane” just starts, seemingly in media res, with Neil in full guitar flight, playing a riff that is now, of course, instantly recognizable: a long trail of sustained notes that cyclone around each other for a few measures until Neil starts singing. Sonically, “Like a Hurricane” sounds different from just about anything Neil had done before or since: the swirling guitars, the even simpler-than-usual beat that pushes against itself after each verse, and of course, instead of rhythm guitar, Poncho Sampedro is playing long sustained notes on a synth that became known as the “Stringman,” providing both cover and atmosphere as they all harmonize on one of the most gorgeous choruses Neil ever put together. Apparently when Neil wrote this song, it was during a period where he had just had an operation on his vocal chords, so it was a few months before he could actually sing it, which probably is why it’s such a clear and atypically clean vocal performance, especially on the sublime second verse. Listen to how the Stringman slides in there on “that perfect feeling / when time just slips,” adding extra beauty and power to that line. 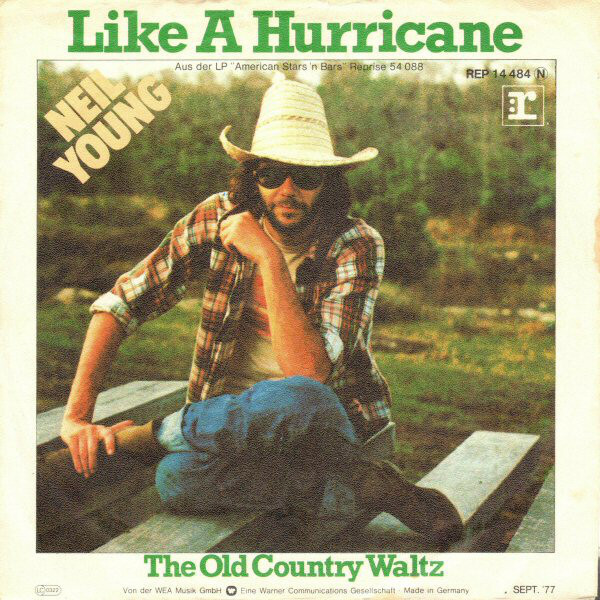 But of course, as awesome the lyrics and melody of “Like A Hurricane” are — and they were awesome enough for Reprise to release it as a single in 1977 — those aren’t what made it immortal. It’s the guitar solos. Which are delayed. Usually on Neil’s long jammy songs, he throws in a guitar solo after each verse / chorus, but that’s not the case of “Like a Hurricane.” Instead, after the first chorus, he goes back into the riff prior to the second verse. It’s after the second chorus that all hell breaks loose: he’s not even done singing how he’s getting blown away, and his guitar already exploding with a torrent of cyclonic notes that almost cohere into what would be a normal guitar solo, but instead arc against each other, the Stringman and the rhythm section, smashing, echoing spattering against the speakers. And then again after the final chorus: a sad series of notes setting up the next three full moments of ragged guitar glory, sounding every single little bit like the hurricane that the song is about, Neil making weirder and weirder noises on his guitar, all of it totally and completely unprecedented, and, of course — as the solo bends its way to the end of the song — now totally and completely iconic. And because it’s so iconic, it’s become one of the Neil songs that’s been covered a lot. Not only did we do it in Sedan Delivery — probably the weakest of our Neil covers, because it was missing the Stringman — it’s also been covered by such folks like Roxy Music, Jason Isbell, and The Mission. For such a straightforward song, “Like a Hurricane” has a bit of a weird release history. It was originally slated for the infamous unreleased Chrome Dreams album, and while the album that it ended up on — American Stars ‘n’ Bars — was weaker than Chrome Dreams would have been (and probably his weakest album of the 1970s) (which goes to how great his 1970s was that the weakest album had frakkin’ “Like a Hurricane” on it), but the release of Chrome Dreams would have meant that Neil might not have recorded the superior versions of “Pocahontas,” “Powderfinger” and “Sedan Delivery” that formed the backbone of Rust Never Sleeps, so things probably worked out for the best. Then, of course, there’s the fact that Reprise released a 5:24 version of “Like a Hurricane” as a single, not even bothering to do a “Part I” and a “Part II” like James Brown or Television. Even weirder is the fact that it charted in the punk-crazed U.K. OK, it only got to #48, but still, it was his first single to chart there since “Heart of Gold,” and one of only three Neil Young singles to chart there ever (the third was “Four Strong Winds” in 1978) throughout the 70s & 80s. Finally, probably because it came out only a couple of months after American Stars ‘n’ Bars, the version of “Like a Hurricane” on the original vinyl of Decade had a different vocal take than the album version, which I haven’t heard in over 35 years because I lent it to Mike Branum and when they released Decade on CD they used the album take. 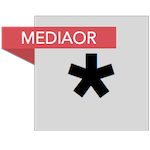 So it goes. Along with “Cortez The Killer,” I think that “Like a Hurricane” has become perhaps the Neil Young song that fans want to see the most in concert: there’s something thrilling about seeing the portable Stringman descend from the sky, so that Frank Sampedro or Nils Lofgren or whomever can play it while Neil just goes off on guitar. Last night, in addition to the signature “reep reep reep reep” Neil did on post-verse turnaround, “Like A Hurricane” was that unique blend of maybe Neil’s most beautiful melody — which is saying something — combined with shimmering spiraling waves of guitar that floated iridescently around the room, as Molina and Talbot almost even got uptempo for a moment. 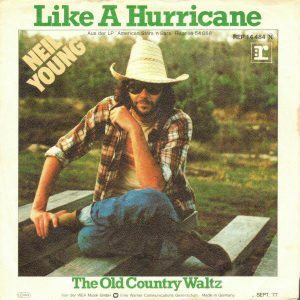 40 years later, and Neil Young and Crazy Horse are still figuring out ways to make “Like a Hurricane” even more transcendent.